An easy to navigate and organized Sakhalin Island Site. On the beach in Alexandrovsk. We went to the beach and this is a rock formation that is famous to Alexandrovsk, it's called the Three Brothers. We were driving by this on the way to the baby home and I had to take a photo because it is so picturesque and typical of houses in the area. It makes me think of the Russian fairy tale houses. Play yard in back of the baby home. This play yard was bright and cheerful with seats for the adults. Of course you have to remember that it is really harsh in the winter and they don't have enough money to maintain it all of the time. This outdoor playyard was set up in the side yard of the baby home. They rolled up the carpet and took it inside when it started to rain. A better picture of our guardian angel. She is one of the nicest people you will ever meet. She made a dinner/snack on the train with her trusty folding knife. (I want one!) She is an angel and is always thinking about how to make things nice for everyone. 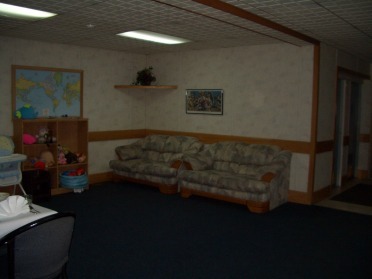 A reconfigured room in the baby home. 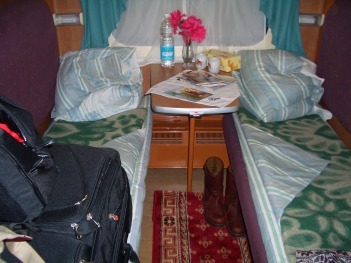 On the train to Alexandrovsk. The large water thing at the end of the hallway is a samovar that they heat with the pile of wood that's in front of it. That's a conductor. Whistle stop on the way to Alexandrovsk. This was on the way from Yuzhno to Alexandrovsk. This woman was selling these large boiled crabs in the middle of nowhere, but it was so hot on the train that I thought noone would possible want them. Surprise, people bought them to eat on the train. American Food Court at the Incheon Airport. This place is great! I felt sort of at home, except for the place called Green Food. They all take credit cards. There are also some donuts at the Dunkin Donuts that are just strange (to me) but good. I especially liked the glutinous rice thing that was sweet(ish) with veggies. Korean Cultural Experience at Incheon Airport. They do arts and crafts projects (you sit and they help you) for free and have Korean music and dance performances here. Just be sure that the project that you do is small enough to pack on the plane! The Korean food court at the Incheon Airport. When you get into the airport from one of the wings, if you go left you will find food courts. There are also free internet areas. This one is located upstairs in the waiting area. Go up the escalators next to the transit hotel, when you get to the top of the escalator, turn around and go back the other way, keep walking past the small cafe and zig zag till you get to the free internet kiosk and the waiting area. I am going to keep posting pics as fast as I can, check back for more. I will put as many as I can, I have pics of the bedroom, kitchen,bath,outside,in the town,and pics of the hotels that we stayed in while in Vladivostok, Alexandrovsk and Yuzhno. This was looking out the window. 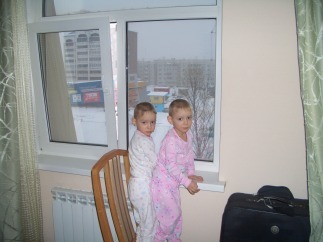 This was at the family hotel in Alexandrovsk, our view from our room. During the summer, I bet that the garden looks pretty. Those metal roofs on the other side of the fence are garages, I think. People rent them to keep their cars. In the exact center of the photo, there is an outhouse(on the left side of the center street). Air ionizer in the bedroom in the baby home. This looked dangerous and hung from the ceiling in the bedroom. 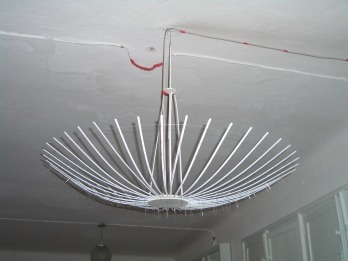 It looks like an umbrella that has been stripped of cloth and riddled with straight pins, we were almost afraid to ask. We got the courage up and we are glad that we did, I would never have guessed an air ionizer. It has a cord that runs down the wall and plugs in. 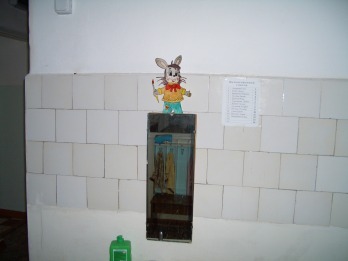 Baby home in Alexandrovsk bathroom again. Someone drew this little picture and put it over the mirror on the wall over the sink. I think that it's cheerful. He is a current cartoon character (can't think of his name) he and a wolf are constantly at odds with each other. He is a good little bunny and the wolf always tries to eat him. If you see any cartoons in shops there with these characters, get one, they are fairly easy to understand even without knowing Russian. They sing and are cute. 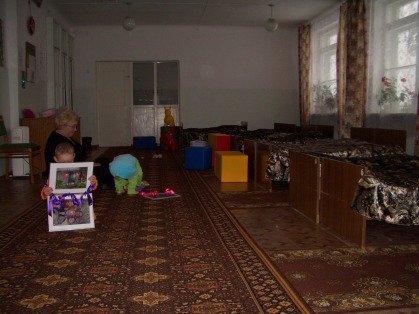 In the bedroom of the baby home in Alexandrovsk. The girls did a lot of running around while we were visiting them. They managed to pull the curtains down and the director was very sweet about it. There were pretty flowers in pots on the windowsills and the ceilings were about 15 feet high. 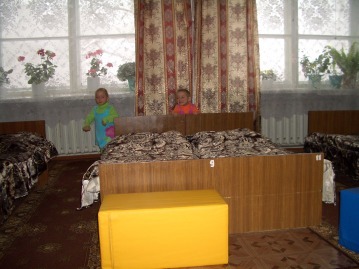 The beds are pushed together in twos so that none of the children are really alone. 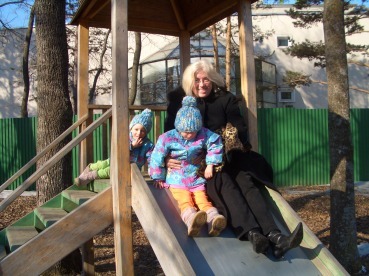 In the baby home in Alexandrovsk. This is the doctor with our girls. She was showing us that they understood basic instructions that a three year old would know. However, we understood that it would take a while to get to this point in English. They are on par with their age finally after 2 1/2 years here. I have heard that for every year in an institution, you should allow an equal amount of time for the child to "catch up". 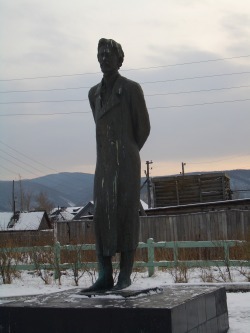 Statue of Anton Chekhov in Alexandrovsk. 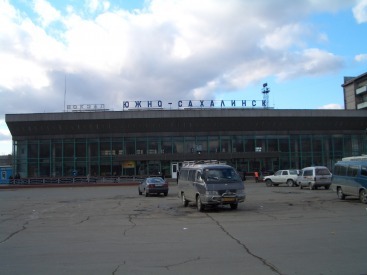 Anton Chekhov made a trip across Russia to follow the footsteps of those that were sent into prison and exile on Sakhalin Island. He wrote a book titled Sakhalin, and the people of Alexandrovsk are very proud of the fact that they have an interesting heritage of having been the prison island. 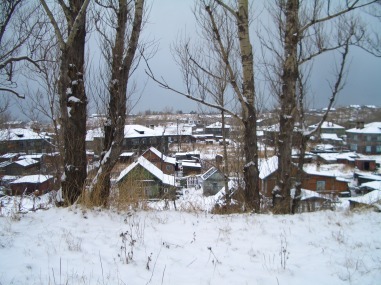 The town of Alexandrovsk was initially probably for the families of guards and prisoners. 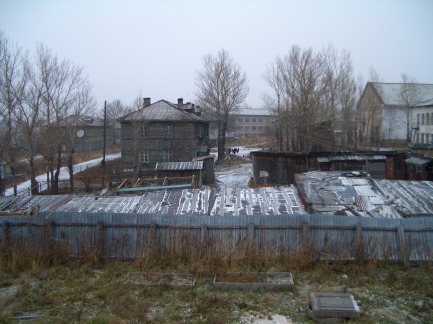 The sentence of exile meant that prisoners once set free were never allowed to leave the island for the rest of their lives, therefore they stayed nearby or went to Yuzhno in the south. He made the trek across Russia to feel the pain and endure what exiles had to do. The typical sentence was a 2 year trek across Russia from Moscow on foot, then crossing the frozen sea in winter onto the island, the sentence on the island in the prison itself was 6 years and then exile for the rest of your life. Just south of the town of Alexandrovsk is a memorial commemorating where the killing fields of Stalin were in the woods. They have erected a large black stone memorial and are proud of the fact that the government has changed so much so as to allow this. 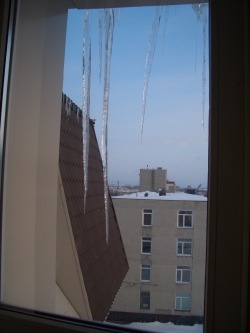 more icycles outside our room in the Imperial Sakhalin. I guess that I just can't get over how big they were. 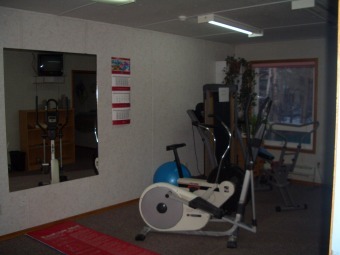 The exercise room available at the Vlad Inn in Vladivostok. This was free to everyone that wanted it, we spent our time chasing two 3year olds and that was plenty of exercise for me. Computer room upstairs at the Vlad Inn in Vladivostok. Tennis court out behind the Vlad Inn in Vladivostok. 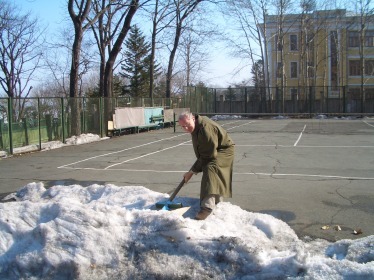 Here is DH shovelling the tennis court before playing tennis, hah! just kiddiing. You can ask for raquets and balls an play anytime there isn't a mile of snow on it. They were already playing on this court every day and it was June. Outside the Vlad Inn in Vladivostok. They had a nice play area set up for children near the back of the hotel. There was also a tennis court and you could get raquets and balls to play with from the front desk. 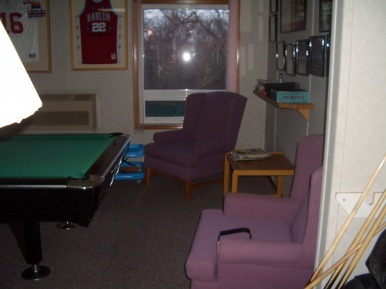 The club room/sports bar at the Vlad Inn. If you order food from the kitchen, they will bring it up and you can eat here. They have a CD player and a pool table. 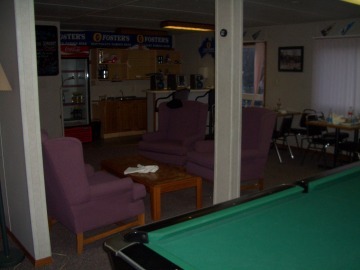 One end of the club room/sports bar at the Vlad Inn. They have a large club room, this is just one end. This is the lobby area of the Vlad Inn set up with tables and chairs for the evening. They also have large group functions there so things get moved around a lot. We couldn't be in this area while a wedding reception was being held, but we went upstairs to the club room. 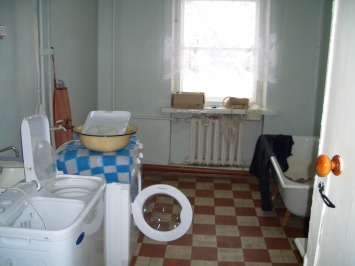 Our bathroom at the Vlad Inn in Vladivostok. There was also a bathtub. Very nice and normal. 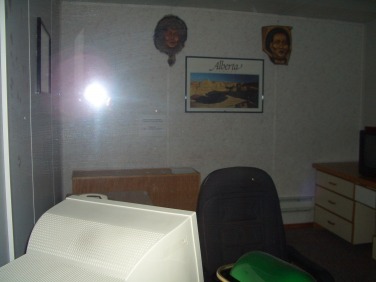 This is one of the rooms in the Vlad Inn in Vladivostok. They put us in two rooms with the doorway open between them so that we could use the fridge and microwave. (we used the beds in the other room which had no kitchen stuff) This was easy to childproof. The beds were also more comfortable than the Sakhalin Sapporo beds. In the lobby of the Vlad Inn in Vladivostok. this is a really great hotel that is western style (run by a Canadian couple). It is really child friendly, they clear out the chairs and put up toys and a cute play castle. You can eat in the dining room or in here. 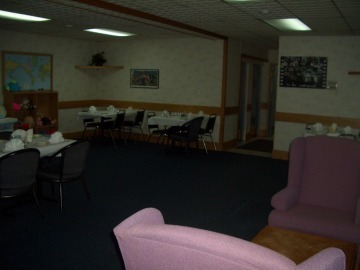 You can also eat in the club room upstairs. They usually put adopting families on the first floor for easy access. The rooms were very nice, much like hotels that I'm used to here in the US. The food was also western style, meaning, when you order a burger, you get fries with it. 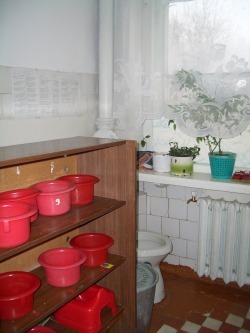 Laundry room at baby home. This washer and dryer was bought with money donated by adoptive families. The donations really go to help the orphanage by getting upgrades and new things that they wouldn't normally be able to afford at all. This washer and dryer handles all of the laundry for the entire place. Fairly small but nice. You walk out onto the tarmac to get on or off the planes. I don't know if this has changed in 2 1/2 years. In winter this is not good, we ended up taking off our coats and checking them with our baggage but kept the girls' coats on them because of the weather(snow) as we were leaving. We wouldn't need them in Incheon(not going out of the airport) and on to the US(going south), but it was too cold for the girls to NOT have a coat. People looked at us like we were crazy, we were just happy that they didn't turn us in(probably because we kept the girls' in their coats). There is (or was) one person with a luggage cart to get your stuff to your car if you need. They had to wake him up last time because he was sleeping behind the counter. Something to do in the Incheon Airport while waiting for plane. We found the cultural center at one end of the airport, opposite the food court I remember, and they had various arts and crafts to do and create neat things like fans and kites. Also there are two play areas in the airport with climbing toys and cartoons on a TV. 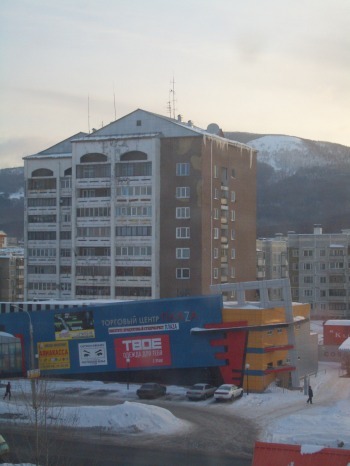 This is the grocery store across the street from the Imperial Sakhalin Hotel. It's not the big building in the back(that's an apartment building), it's the wierd shaped building in front. Nice supermarket though, and within walking distance. I'm sure that it would be easier to get to it during the summer. Our luxurious seats on Asiana. They bumped us off of our flight home, but upgraded us to business class which was really nice(they delayed us in the airport by 24 hours and we had to stay in the airport hotel, but that's another story)... buuuuut, just try to relax while they serve the exclusive few in that cabin and keep two screaming, scared children happy. We ended up staying in the stewards nook through most of the flight, taping playing cards to the cabinets and keeping an eye on two little girls that wanted to explore the top of the dangerous stairs. It was still better than the crowded area below. Maybe one day I'll fly in business class and enjoy the leather seats, linen tablecloths and real wine glasses! The window in our room at the Imperial Sakhalin in Yuzhno. The girls were fascinated standing and looking out the window. The windows also close and then open like a door. We tried to keep them from seeing us operate the windows but it was scary when they saw how we did it and tried. There really is no way to lock these windows, we were on the 7th floor I think. We had to crack open the windows because they crank up the radiators in there and it is sweltering (with an icy blast of cold air from the window). 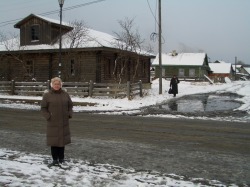 In the Imperial Sakhalin in Yuzhno. This was not very childproof. 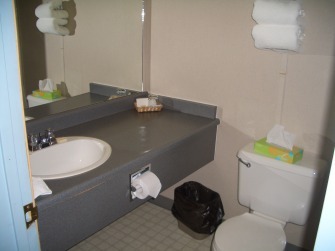 Inside toilet area in bathroom. They sent home one of the potties with us, our girls didn't really use it though. We went back to diapers for a while, they gradually potty trained themselves at their own pace. We figured that they had enough on their plates (so to speak) that they didn't need trying to go on the potty along with learning a new language. They were a lot happier after that decision. This is Alexandrovsk in November. It looks bleak but remember that a lot of the year there is really harsh weather there and it is expensive to repaint. It is mainly a coal mining town and there is a lot of offshore drilling that helps a few of the residents. In the kitchen at the baby home. Everyone was really nice, they were fixing lunch for the kids in this picture. 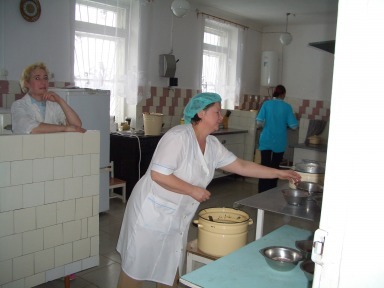 The little metal bowl is one of the children's bowls, they were making borscht that day and it really smelled good. 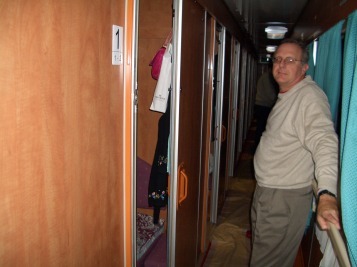 Steve in the hallway of the train from Yuzhno to Alexandrovsk. He is standing in front of the windows(blue curtains) and they haven't removed the paper from the floor yet (they put down paper on the hallway floor to keep it clean as people get on, then remove it once underway) he is facing the room. 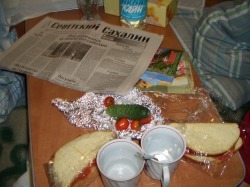 This was some of the snack on the train. I didn't think that they were going to feed us, but they gave us a great snack! You should see the meal they gave us the next time! Soup to Beer and yogurt. On the train going from Yuzhno to Alexandrovsk. This was really neat, a sleeper car. The sheets are real linen, and there is a large hot water cistern down the hall so you can make hot tea, just bring your cup. 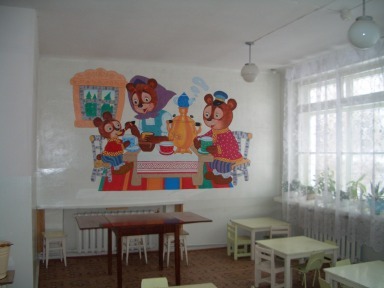 Dining room at baby home. I love this mural on the wall, someone took a lot of time and care painting it to make it cheerful! There is a samovar on the table, a new take on the three bears. 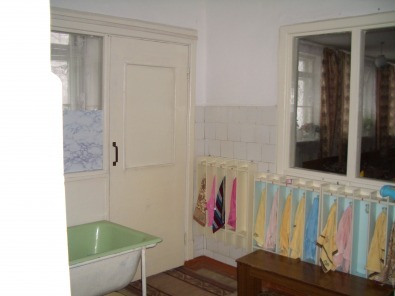 Cute little rows of towels, through the door is the toilet. In the bedroom for toddlers. 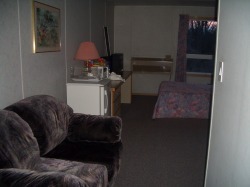 This is one of several bedrooms. This is nice with big windows and a wall of wardrobes filled with clothing (and a vacuum cleaner that the girls managed to find). Me standing in front of the Chekov museum. The people of Alexandrovsk are very proud that Anton Chekov came to their city and took the route taken by the people that were sent to exile there. He wrote a book of his experience and they built a museum of his experience. Looking at the church across the street in Alexandrovsk from the hotel. 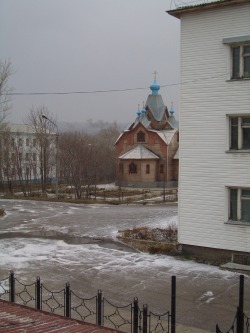 This is looking out the front door of the hotel in Alexandrovsk, this is the smaller family run hotel.